Heads propped up, glazed over eyes, and dull responses are the last thing we teachers want to see in our classrooms. They are a true sign of deep engagement boredom, and certainly not going to help kiddos learn. So, how do you get high engagement, deep thinking, rigor, and content that matches your standards? 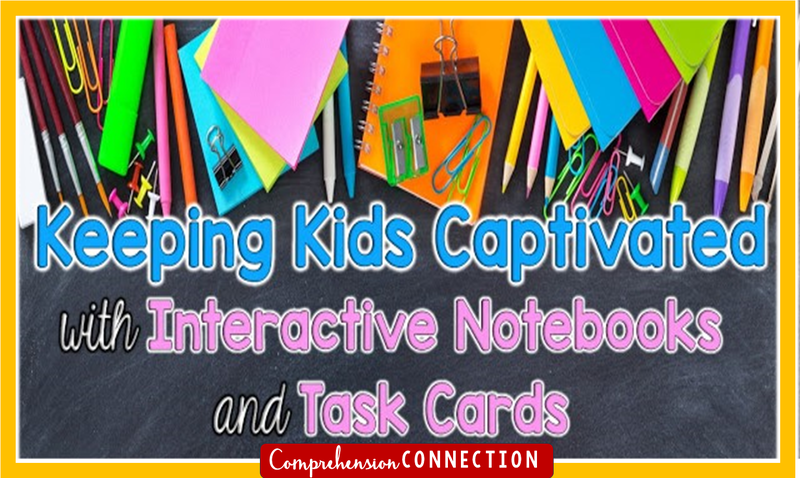 One option we love are interactive notebooks and task cards. Mandy from Mandy's Tips for Teachers has a great post about how to get started with interactive notebooks, and if you have questions about the best glue to use or how to set them up, be sure to check it out [here]. I have really enjoyed using interactive notebooks for a while. Students are actively engaged, and you have an ongoing artifact of learning to show parents at teacher conferences. Plus, they work well for reference when it comes time to study. 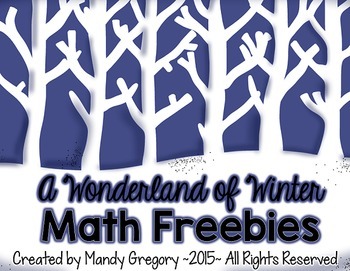 Mandy has donated this great interactive notebook for winter for the middle grades, and she has this teaching tip to share with you. Clear off your desk or table everyday before you leave. Makes things much smoother in the morning! Another team of bloggy friends has shared an interactive notebook set too. 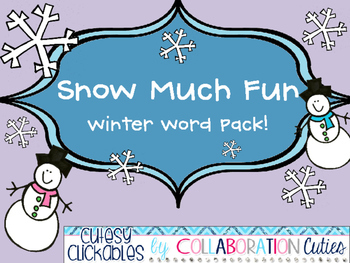 Amanda and Stacia at Collaboration Cuties created this winter interactive notebook set. I love the versatility of this product as it can be used with any text and hits skills for upper elementary. Imagine how fun it'd be to use these with Tacky the Penguin or Owl Moon. Here are a few thoughts from Amanda and Stacia on using interactive notebooks with your kids. Interactive notebooks are an engaging and valuable resource for students. We love using them in every subject because they are a fun, hands-on learning strategy! There are many different ways to use interactive notebooks. In Social Studies and Science, we paste in articles related to a topic we are studying on the right side of our notebook. Then, we carefully read and discuss the article, and we take interactive notes on the left side. 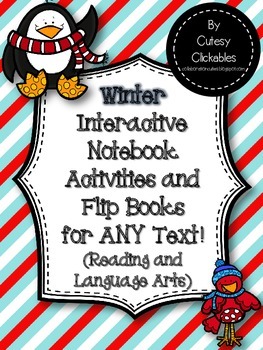 These notes can be pictures, words, flip books, graphic organizers, or other foldables. You can even have students color code the notes by paragraph or topic! We’ve found that our students understand and remember the information so much better through interactive note taking. And, these interactive notes are a perfect study tool! In Reading and Language Arts, we use interactive notebook flip books and graphic organizers to organize and show our thinking. Students may find the main idea or analyze character traits. Or, they can identify adjectives and figurative language. Interactive notebook activities can be used whole group, small group, as partner work, independent work or in centers. Students love completing reading flip books with their independent reading books and in guided reading group. 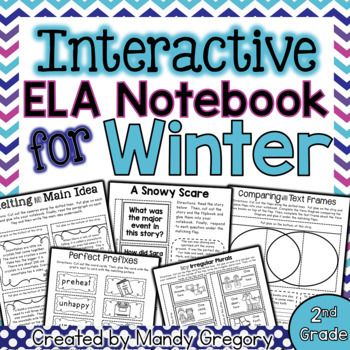 We love using seasonal interactive notebook activities that can be used with any favorite text! The last item for today comes from the friend who got me started with blogging and Teachers Pay Teachers. Andrea from Reading Toward the Stars and I completed our Masters program together, and it's been so great continuing a friendship that started ten years ago. We love talking reading and blog together on three different collaborative blogs, Classroom Tested Resources, Adventures in Literacy Land, and Virginia is for Teachers. Her donation is a bundle of Cause and Effect Task Cards. 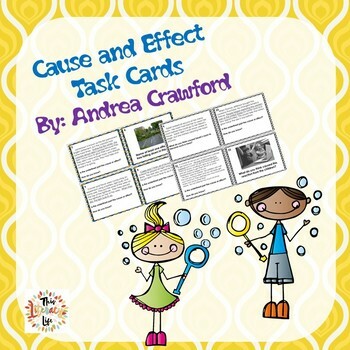 Task Cards are such a versatile teaching tool. They work well for games (think high engagement), Scoot, or quick reviews. They are also great for centers if you put the answers on the back for self checking. When using task cards, make it a game by using game boards or specialty cards to make it interesting. The kids think they are so much fun but are learning at the same time. In addition to the three great products from my bloggy friends, a t-shirt is included from A+ Images. Last summer, many bloggers received free shirts from A+ Images. (so generous, right?) Well, I just loved my shirt, so when I was in Las Vegas this summer at the TPT conference, I picked up a few to include in a giveaway. The quality is awesome, and if you're looking for a company to do shirts for your field day event, for your school logo, or other activities, be sure to give them a try. [Here] is the link to the company. These gals all have freebies to share with you too. Click below to check them out. In addition to interactive notebooks and task cards, teacher modeling and group discussion increases engagement and motivation too. I love a rich discussion, don't you? 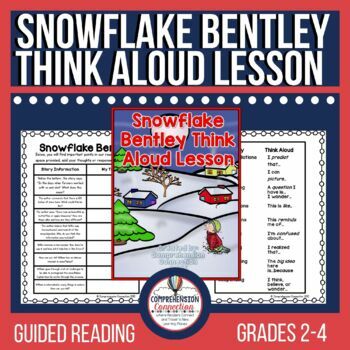 This freebie from my store goes with the book, Snowflake Bentley. 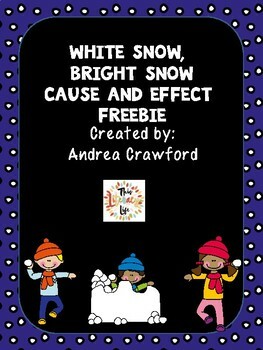 It uses the Think Aloud process which is explained on Adventures in Literacy Land. Think aloud is a highly effective strategy for struggling readers. Check it out! See you tomorrow, and thanks for making this celebration possible!